Mountain Hardwear completely reinvented nylon to create the Ghost Whisperer fabric — an incredibly lightweight, stretchy, wind and water resistant nylon. We talked to the company's head designer about how it's made. Top Photo: I'm wearing Mountain Hardwear's Ghost Whisperer Hooded Jacket here on the summit of Mt. Baldy. At only 2 oz (just a hair more than a golf ball! 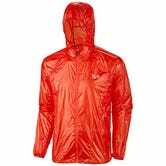 ), the jacket is so light that you may forget that you're wearing it, but it still provides an effective, durable and breathable wind barrier. That adds appreciable warmth on chilly mornings and, because it packs down as small as a standard pill bottle, there's no reason not to keep one in your pack. The closest the competition manages is three times the weight and a packed size equivalent to an apple. What makes Mountain Hardwear's new Ghost Whisperer fabric so different from other nylons? We asked Robert Fry, Global Director of Product Merchandising and Design at Mountain Hardwear. Mountain Hardwear is known for its radical thinking within the outdoor apparel and gear industries, continually inventing (and re-inventing) the most functional and innovative gear available. We asked them how their latest development in fabric came to be. IW: In layperson's terms, what is the Ghost Whisperer fabric? RF: The Ghost Whisperer fabric is the lightest nylon ripstop fabric commercially available. We use incredibly strong, remarkably light 7 denier yarns (a denier is a yarn's weight in a 9000 meter segment — so 7 denier means a 9 kilometer long filament weighs 7 grams!) to create the woven fabric matrix. Because the yarns are so small, they can be woven very tightly together, making the fabric much stronger than heavier fabrics. And because the yarns are so small in diameter we use magic pixie labor, which is both expensive and rare. We're currently in talks with the International Pixie Union to increase the workforce because our Ghost Whisperer has become so popular. IW: What makes GW fabric special? What can it do that other fabrics cannot? RF: Well, besides the fact that it's made by pixies, it's incredibly strong. Many lightweight things sacrifice stretch to achieve light weight. As noted earlier, GW fabric is stronger than many, much heavier fabrics in both tear and puncture — which matters a lot when used in a down jacket. A closeup of the MHW Ghost Whisperer Hooded Down Jacket. IW: What made MHW realize that there was a need to evolve a common material like Nylon? RF: Many industries, tech and automotive being the most obvious, evolve at a faster rate than the apparel industry. Those industries feed a consumer base that is hungry for innovation and newness. We pulled a page from that world and said, "Hey, current nylon technology is fine and doing a reasonable job, but what have we done recently to improve the user experience? What have we done to give the consumer a reason to care about the fabric employed in their garments?" With that in mind, we focused on creating something that was unmistakably better than what the consumer is used to. It takes about 5 seconds for a person to realize the Ghost Whisperer is something special. IW: How did MHW initiate and work through the research and development process for the GW fabric? RF: We have an intimate partnership with an extraordinary supplier in Japan who is able to innovate and iterate with greater facility than other mills/finishers. They are a terrific partner that urges us to brief them with challenges that they seem to enjoy overcoming. It's a great friendship that has given us access to the only loom in the world that can produce the Ghost Whisperer fabric, for instance. IW: What were some of the challenges encountered when developing the GW fabric? RF: Achieving the desired strength in such a light weave was a big challenge. It took some time to figure out the density of the weave. And, like many high end fabrics, cost was a concern. From the actual filaments that make up the yarns, to the relative slowness of the single machine that weaves the stuff constantly just to meet our demand, cost creep is an ongoing challenge. It's the nature of building such a special formula and it usually doesn't pay to cut corners on this kind of project. Too many people are counting on these jackets in crux situations. The Ghost Whisperer fabric is so tightly woven that it is water resistant. IW: What makes the GW fabric so difficult to weave that only one mill in the world can weave it? RF: See the aforementioned pixie labor negotiations. In all seriousness, to successfully handle such a fine yarn, the loom must be in absolutely perfect working order. All spools, guides, lubricants and jet settings need to be very precisely managed. One can imagine the number of potential auto stops a machine would make running a 7 denier filament. Just a little too much resistance in the equation and a yarn breaks and production stops momentarily. IW: How does the GW fabric stack up against traditional nylons? RF: The Ghost Whisperer fabric is lighter by a long shot. But since the filaments are so tightly wound and the filament quality is so tightly controlled, the fabric is very strong. IW: Does designing products that use the GW fabric present any challenges? RF: Certainly. Sewing machine needles size, SPI (Stitches Per Inch), bobbin tension, etc all demonstrably affect GW fabric more than other heavier fabrics. Because of those reasons, we need to design smartly and partner with very good production vendors to ensure final product quality and, ultimately performance. I'm sure, if we could, our team would make nearly everything out of the GW fabric! Our Design team loves challenges. Realistically though, the current Ghost Whisperer Jacket consumes all the fabric that we can make so even if we were keen to explore the possibilities, we'd run up against some limitations, at least initially. IW: What applications is GW not appropriate for and why? RF: Well, I don't think I'd make socks out of it. And it might be a phenomenal tent fly material, but the finished tent would be $2,000. I think we'd struggle to make it work in a pack. While the fabric is very tear and puncture resistant, we generally sacrifice some light weight to get more abuse-friendly abrasion and burst strength. Those are priorities in a pack, less so in a puffy jacket. 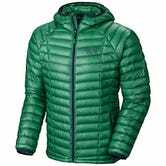 The 8 0z Ghost Whisperer Hooded Down Jacket is the lightest full-featured down jacket on the market. IW: The GW fabric is currently only being used in apparel, and it's revolutionizing those product categories — are there plans to expand its use to other products, for instance sleeping bags? RF: Actually, we do use the GW fabric in one sleeping bag which was developed in collaboration with our friend and team athlete Ueli Steck (the Swiss Machine). It's a very specialized piece, called the the Mtn. Speed 32. It's a 1lb down sleeping bag rated to 0C/32F degrees that Ueli has used on high peaks in the Himalaya. IW: Which users can benefit most from GW? RF: I think anyone interested in ultimate performance, and absolutely minimal weight, would benefit from the GW in their product kit — in apparel, sleeping bags, or some other heretofore unexplored product category. Just so long as they like pixies. Lead and final photos: Chris Brinlee Jr.